Private Vatican Tours are extremely limited, this exclusive and private after-hours tour of the Vatican & Sistine Chapel begins after the Vatican Museums closes to the general public. Visiting the Vatican art galleries during the off-hours hours is a once-in-a-lifetime experience. During this exclusive after hours Vatican Museums tour, you will explore its artistic and architectural treasures completely free of the crowds. Your private after hours Vatican Museums tour will begin in the Museo Pio Clementino, home to the Pope’s collection of magnificent Greek and Roman statues, including the Apollo Belvedere and the Laoocon, the museum’s most famous and dramatic marbles. The Vatican Museums is the largest museum complex in the world with over 1400 rooms. Next visit the Papal Apartments to see the sublime Le Stanze di Raffaello (The Raphael Rooms), painted by Raphael for Pope Julius II. Similar to the frescoes in the Sistine Chapel, the Raphael rooms focus on a representation of the Church intended to transmit the message of Renaissance Ecumenism: dialogue and synthesis with Classical thought and Art of the past. The Vatican’s artistic magnificence culminates in the Sistine Chapel, which Pope John Paul II called “the Holy Spirit’s place of action”. It is here that cardinals have gathered throughout the centuries to hold conclave and elect a new pope during, perpetuating the line of succession from St. Peter. The Sistine Chapel’s artistic immensity has become synonymous with the genius of Michelangelo. Within this theological sanctuary of the human being, the line of demarcation between faith and art seems almost invisible. Experience the thrill of stepping into this atmosphere of magic and mystery as only Popes and Cardinals have done, choose our vatican after hours tour! Imagine yourself holding the very keys that unlock the doors to the one of the world’s most celebrated treasures, enter and absorb the silence and ponder the possibility of taking pictures. 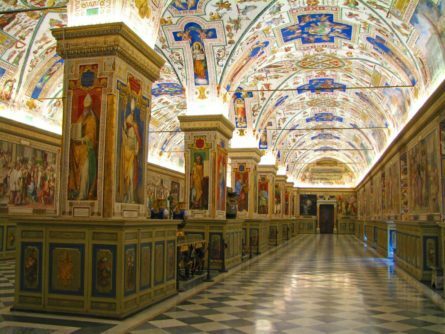 An English-speaking Vatican guide highly specialised in Italian Renaissance art will host your after hours Vatican Museums tour. Why Is This After Hours Vatican Tour So Exclusive? – PRIVILEGED RELATIONSHIP WITH THE VATICAN. The Vatican receives thousands of requests for private visits and only a select are granted. We have had a special relationship with the Vatican for more than 30 years, which guarantees us privileged, exclusive access to accommodate private visits even with little prior notice. – HOW WE ARE DIFFERENT FROM OTHER PRIVATE TOURS. Very few of our competitors obtain this level of exclusive access, as theirs is limited to the classical itinerary -a style completely different from ours- for which they are obliged to sell to a group of individual clients rather than privately. – EXCLUSIVE ACCESS. We reserve the entire Sistine Chapel so your access is absolutely exclusive. With the exception of the Vatican security staff, you -our client and your family, friends and guests- will have the Sistine Chapel all to yourself! You will have the rare honor of contemplating Michelangelo’s masterpiece on your own. – OUR HIGHLY QUALIFIED ENGLISH SPEAKING GUIDES – all licensed and specially trained by the Vatican- will unveil the genuine hidden story of this spectacular space. These “Vaticanists” hold Master’s degrees in Art History, and above all, are storytellers who weave captivating tales to convey the history and artistic message of the museums to any type of listener, including children. No question is too off-beat and no detail too small to be ignored. – A FULFILLING EXPERIENCE. Enter the museum -only you, your guests, your guide and a Vatican guard. Inspect, look, enjoy and contemplate the details as you wonder without the push and shove of the crowd. Throughout the tour, the Vatican security officers accompany guests and the Vatican reserves the right to make last-minute changes to the tour schedule. The standard itinerary is listed above. However other than Cappella Sistina (Sistine Chapel), we cannot guarantee visits to any one room, as rooms may be closed at the last minute for reasons of restoration or at the general discretion of the Vatican Museums.